As a prospective club member, here you will find an overview of the Fort Purbrook ARC and its activities. By far the best way to see what we're about is to visit us on a club night. As a potential member you can just turn up at the Fort on the last Friday of the month, but please always check the Events page of this website to confirm meeting arrangements at the Fort, as sometimes we change meeting locations within the Fort at short notice. Please note that membership is not automatic and is subject to committee approval, so that's why it's best to meet us and then you can see if the club suits your requirements. You can visit up to three times before application for club membership is required. This gives us plenty of time to get to know each other. If you then wish to apply for club membership, application forms and a copy of the club constitution are available on the night. Cost to join is £30 per annum and there is no joining fee. No fee is required until your membership application is approved. Membership cards in the form of ID Badges are provided for successful applicants. Successful applicants are given access to our 'members only' Bulletin Board Service. This contains sixteen individual discussion Forums covering, for example, Club Events, Antennas, Equipment, QRP and Homebrew. We have some very knowledgeable members in the club who are more than willing to help newcomers with any questions that they may have. If you are new to the hobby, or you are seeking to upgrade your licence, we can provide training and an examination venue. The Tuition page of the this website has further details. We have no permanent clubhouse, so we hire a meeting room at Fort Purbrook, from 7.00 - 9.00pm on the last Friday of each month, except during December where it's earlier in the month due to Christmas. Here we hold social evenings (Natter Nights), occasional talks, and if you wish you can put the club call on the air using 2m/70cm as we have an antenna for these bands terminated in our regular classroom. As a club, our main operating occurs during the summer months, May to September, using our Marquee up on the Fort ramparts. From 2017 we are relocating to the other side of the Fort parade ground, onto the Western ramparts. Antennas, masts, etc, are still in the planning stage at the moment, but the new area offers numerous possibilities. In the marquee we provide tables, chairs, a mains power supply and a tea urn for hot drinks. Members are welcome to bring along their own equipment and portable antennas if they wish, although we also use the club antennas. These are erected in close proximity to the marquee to try and minimise feeder length. We activate our club callsign, G3CNO using the club rig, a Kenwood TS-590S, combined with an MFJ Manual ATU and a suitable 13.8V DC PSU. We encourage club members to assist in setting up the marquee and antennas and to put the club calls on the air. We welcome people who wish to get involved. That old adage - "the more you put in the more you get out" works for us as a club and encourages team effort along with the friendship and camaraderie that involvement brings. 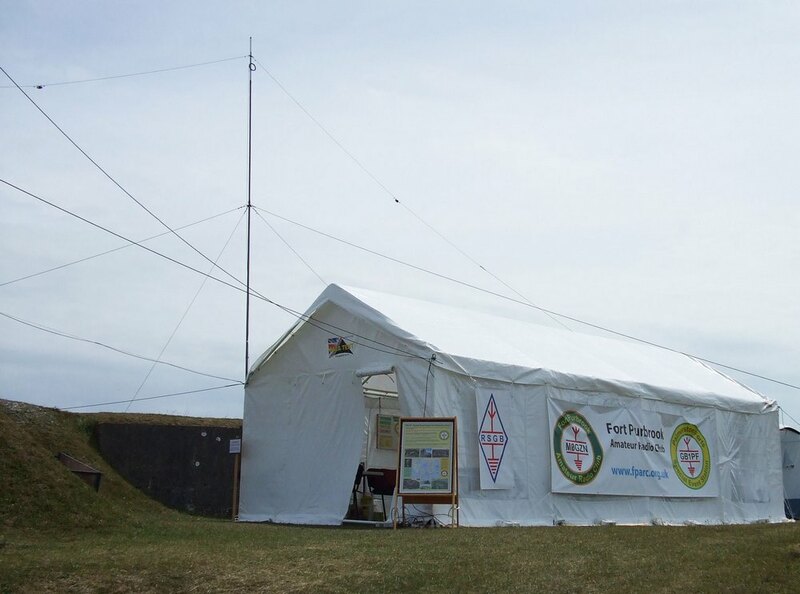 Additionally we now activate the call GB1PF - Special Event Station representing Palmerston Forts, of which Fort Purbrook, our home QTH, is one. GB1PF at QRZ.com has further information on this Special Event Station. Club Clothing is purchased occasionally when we have sufficient orders, with club members paying 'cost' plus P&P. The club makes no profit from embroidered Polo Shirts, Caps, etc. Also please explore this website to get a flavour of our club. We hope to build on what we have achieved with our website, adding further articles and information as club activities progress.